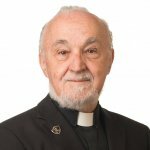 A man has been arrested and Father Claude Grou, rector of the oratory, was taken away by ambulance, according to Céline Barbeau, director of communications for the oratory. Urgences-Santé says he was conscious when he was transported by ambulance. LATEST: A person has been arrested and Father Claude Grou has been taken away by ambulance, according to Céline Barbeau, director of communications for the oratory. The suspect ran at the priest from the back of the rectory and attacked him with a sharp weapon, she said.